TV shows can make you laugh, teach you lessons, or show you new worlds. Here's an interactive and comprehensive list of television shows for families to enjoy together. 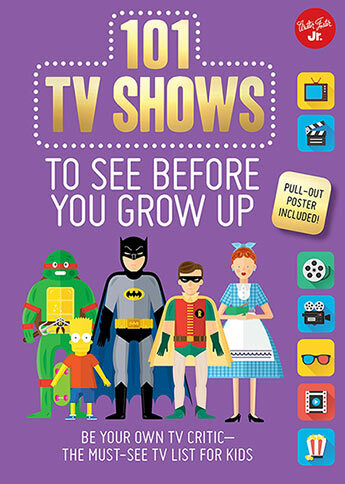 101 timeless TV shows for kids to discover and for families to watch together, all in one book. Can you watch them all?Television shows are made to entertain! They can make you laugh, teach you lessons, or allow you to escape into another world for an episode or two. 101 TV Shows to See Before You Grow Up is an interactive and comprehensive list of 101 TV shows for families to enjoy together. From popular picks of today to classic shows of decades past, kids will discover a wide selection of must see TV shows, appropriate for all ages. Each page focuses on a single TV series with basic information about each show, including the actors, years of production, and rating. There is also a section at the bottom of each page that allows young television buffs to write in their own opinions and observations about the show. From toddler to tween and every age in between, 101 TV Shows to See Before You Grow Up is a fun handbook for TV lovers of all ages.